There is a difference between managers and leaders. Organizations need both managers and leaders. However, we are in a severe need for leaders. The difference is not just in titles or authority. The managers love to keep things moving and make small adjustments to improve quality. The leaders are the ones that will create something that has never been created before. Today’s guest is extraordinary. Carly Fiorina is the first women CEO of a Fortune 500 company. She was the CEO of Hewlett Packard from 1999 to 2005. She shares with us about the difference in managers and leaders. Carly was also a candidate for President of the United States in 2016. Join me in this interview where we discuss the difference in managers and leaders. Don't miss an episode. Subscribe to Leaders in the Trenches. Share the LOVE and TWEET about this episode. Target Audience: “Carly” Fiorina is an American businesswoman and political figure, known primarily for her tenure as CEO of Hewlett-Packard (HP). She subsequently served as Chair of the philanthropic organization Good360. Her mission is to inspire, equip and connect individuals and teams to seize opportunities, face challenges, and accelerate impact in their communities and places of work. Disclaimer: This transcript was created using YouTube’s translator tool and that may mean that some of the words, grammar, and typos come from a misinterpretation of the video. This is leaders in the trenches and your host today is Gene Hammett. Hi, I’m Gene Hammett. I’m the host of leaders in the trenches. My question for you today is… What is the difference between managers and leaders? Well, if you want to be someone who activates the leadership inside of Your Business, then you want to make sure that you’re cultivating more leaders than managers. And I’m not saying men, um, managers don’t have their place and they provide value to the organization. They do, but they only operate within the combined boundaries. I was talking with the author of find your way, Carly Fiorina. 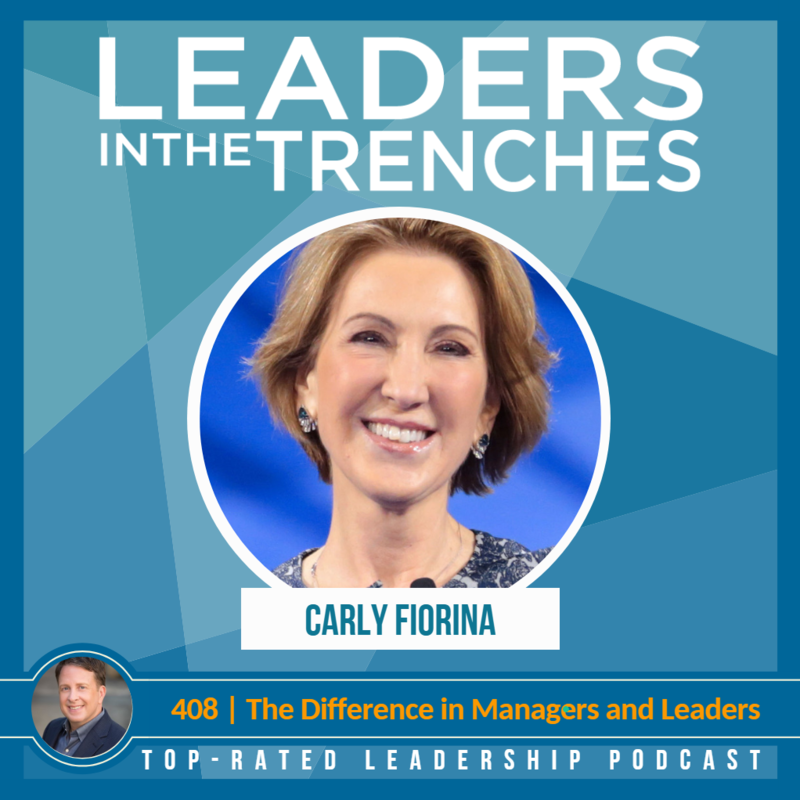 Carly is really good at explaining why you want to be leaders and you want to have leaders inside your organization. And she is the first fortune 50 CEO that was a woman. This was in 1998 – 1999 for Hewlett Packard and she was amazing a leader at the time. And I really love the insights she has around leadership and about activating others to grow and reach their fullest potential. So make sure you check out the full interview here with Carly. Gene Hammett: Hi Carly, how are you? Carly Fiorina: I’m great. How are you doing? Gene Hammett: I am fantastic. I remember getting this email in my inbox and I’m like, wow, I know that name for sure and I kept reading and I’m really excited to have you on this. You are the first woman CEO of a Fortune 50 company, is that right? Gene Hammett: I can believe that. I’ve got an article coming out shortly about what men can learn from women in leadership, so maybe we’ll chat about that a little bit today. I’ve already introduced you to my audience, but I’d love for them to hear your own voice. Can you share us a little bit about you and who you serve? Carly Fiorina: Well, I think the core competence that I’ve learned over the years is problem-solving. I didn’t start out very auspiciously. I must say I was a law school dropout. I was a secretary. I had no idea what I was doing or where I was going. I had no plan to be successful or to rise in business, but I ended up solving problems with lots of other people. And this book is to help problem solvers wherever they are. And my core belief over many, many years and many experiences in many settings is that leaders solve problems. They change the order of things for the better. Gene Hammett: See that within my own work as a leader, my own company and before this running a company to about 5 million and then just working with the companies I see and the audience listening in here today. So I would love to know just a little bit about your journey because I had been reading about you and in some fascinating background from law school that didn’t quite work out the way you want to do and other elements. Can you tell us a little bit about how you got to where you are? Carly Fiorina: Well, I graduated from college with a degree in history and philosophy, which wasn’t exactly, you know, putting me on the fast track. And so like many liberal arts majors, perhaps I went off to law school. That’s what my dad wanted me to do. I was kind of a parent, please. In child I was shy, I was scared of most things. But you know, I was a goody two shoes, the middle child and I try and roll off the law school and discovered quickly that I hated it, absolutely hated it. And so I quit after less than a semester and had no plan. But I was quite a good secretary. I had to help put myself through school by typing in silence. And so I got a job as a secretary in a little nine-person real estate firm. That was my introduction to business. I had never sought about business before then, but two men in that nine-person company said, you know, maybe you should think about business. Carly Fiorina: And they sort of introduced me and eventually I would get an MBA and land in a huge company, AT&T. I wasn’t what people would describe as the typical fast-rising executive. There weren’t a lot of people that look like me. But as I said at the outset, I solve problems and there were loads of problems and I found people all around me who wanted to solve the problem, but it never been given a chance. And as I saw more and more problems, I got more and more opportunities and I wasn’t ever afraid to take one even if it represented a big challenge for me. And I think honestly that it’s a simple as that, which is why in my book find your way. I tell people don’t get too hung up on the destination and the plan. Just get on the right path, which is all about how you choose and how you behave and how you solve problems and work with others. Gene Hammett: Now, I haven’t been reading through the book and I really do like certain elements of it. So I’ve got some questions around this because I think we’re in alignment. One of the first things I want to dive into is, you know, we all have that little negative self-talk, Harley that really stops us. It causes doubt and fear. Are you seeing that at all levels of companies at the top levels is it gets easier as you are the CEO of some multinational company? Carly Fiorina: I actually don’t think it gets easier. I think fear and self doubt our human and in some ways, as the stakes get higher, the opportunity for fear and self-doubt gets greater. It is why I think courage is the first and most essential element of leadership because without courage, the courage to take risks, the courage to make a decision, the courage to withstand criticism without the courage to do those and the ability to say, okay, I fought this through, I can. In fact, we work with others and succeed. I think a lot of people get stuck and they become managers, not leaders and managers kind of manage the status quo. Leaders change the order of things for the better. Gene Hammett: I love it. You say that I write for ink magazine. I guess you probably know that and my number two article last year was managers are a dying breed and what we need instead or leaders. Carly Fiorina: Well, I totally agree with that. I think actually we have a lot of managers. I don’t think they’re a dying breed, although maybe they should be. But I think managers aren’t bad people. In fact, in many cases, they’re very necessary. But managers do the best they can within existing constraints and conditions. Excellent managers produce excellent results within existing constraints and conditions, but leaders change constraints and conditions. They don’t accept the way things are. The truth is that fear of being criticized keeps a lot of people from leading and causes a lot of people to just stick where they are and manage within the status quo. Gene Hammett: And I also see that if a leader has that fear and they strike fear in others, then the best ideas for the need to move the business forward don’t come forth. Carly Fiorina: That’s right. And I would actually argue that someone who uses fear as a motivator is not a leader. They may be a manager, but they’re not a leader. And My, the way I think a big part of this book and a big part of what I do with the clients we serve, whether they’re in nonprofits or for profits, is to get people to think about redefining the word leadership. We tend to think about leaders as people with position and title. If someone has a big title, we call them a leader. Well, as you well know, someone can have a big title in a big office to go with it and they’re not leading. And if they’re using fear, then in particular to your point, they’re killing good ideas and the opportunity for innovation, they’re killing the opportunity to change the order of things for the better, and they’re kind of magnifying the status quo. Carly Fiorina: the core of the book is that each of us has far more potential than we realize. I have learned that over and over about myself. I’ve learned it over and over again about people that I’ve worked with in every setting and all over the world. Each of us has more potential than we realize, and so we can always tap more of our own potential. The highest calling of a leader, I believe, is to unlock potential in others, and therefore it is a leader’s job to find the potential that is untapped in the people all around them. That’s how you actually change the order of things for the better. Gene Hammett: You’re probably not that familiar with my work currently, but I studied the ink 5,000 level companies, the ones that are growing astronomical fees rates. On average. The interviews I did last year, 51 companies grew average 2700% over three years pretty fast, right? Carly Fiorina: Wow. Yes, I would say exceptionally fast. Gene Hammett: I know that it’s hard to believe that you’ve come in from Hewlett Packard. If you guys doubled, you would have thought you had reached the heavens. Carly Fiorina: Yes, we actually did double in size and we were pretty proud of that. But yes, it’s growth has its own challenges for sure. In 27% growth, 2700% growth is amazing. Gene Hammett: Yeah. So I study this and I’ve been having these conversations. I have two or three a week. Sometimes I go to burst and I may have 10 or 12 in a week, but one big idea came out of this, and this is going to be my next book, is the reason why they’re growing so fast is that the leaders are able to inspire a feeling of ownership amongst their people. What does that mean to you? Carly Fiorina: Well, what it means, and I think you can inspire a level of ownership in companies of all sizes and in situations. It doesn’t actually even have to be a company, but what it means is if someone is truly invested as an owner, as a concept in something, then they bring all of themselves to that task and that means that they use more of their potential. If you don’t really care about the outcome, if you’re just treading water, then you know you’re using maybe 10% of what you have. On the other hand, if you’re invested, if you really think, wow, I’m a part of this and you’re going to bring, your employees are going to bring everything they have to the challenge. ADVERTISEMENT: Before we jump into the content, let me just remind you that today’s podcast is brought to you by Audible. 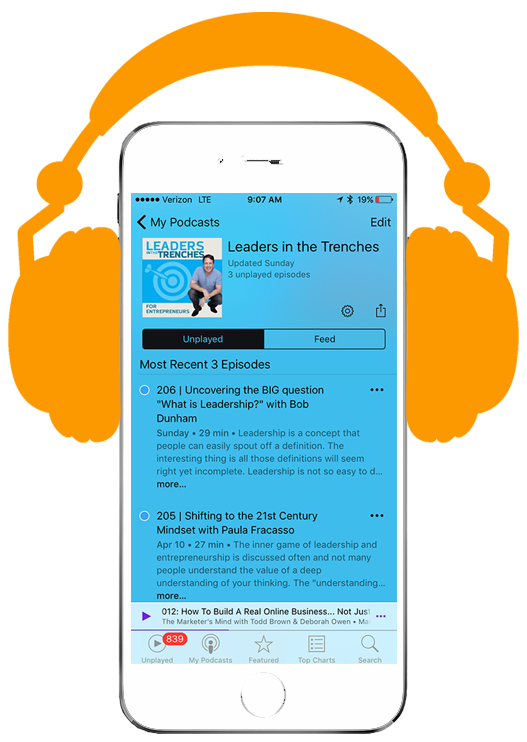 If you like to listen to podcasts, you probably like to listen to audible books and I want to give you a free 30-day trial and all you have to do is use this URL, which is audibletrial.com/leadersinthetrenches. That’s the name of the podcast. Just go there. You can buy any book you want. I’d love for you to buy the trap of success. That’s my book that came out earlier this past year. And if you want to get the 30-day trial, just go to audibletrial.com/leadersinthetrenches. Now back to the show. Gene Hammett: You do a lot of leadership workshops and I would love to know one or two key things that you share that everyone just kind of, oh my gosh, I had no idea that was the way we lead. Does something come to mind when I asked you that question? Carly Fiorina: Well, three or four things come to mind, but let me just pick one because it’s so fundamental. I tell a story of being 15 years old in Ghana, West Africa and riding along a road and seeing these huge mounds of dirt on the side of the road. And I asked my Canadian friend, what are they? And he said all those or termite hills. And the reason they get to be so huge is that termites spend their whole lives going on the same path day after day, moving their dirt, moving their dirt, moving their dirt. And then he looked at me and he said, people, are a lot like termites. And I saw it a lot about that. But the truth is we can all, each of us can get in our ruts moving our dirt. We got a lot of work to do. There’s a lot going on in our day. There’s a lot of activity, there was a lot of emails, there’s a lot of tweets we got to respond to. We all can get on a path and start moving our dirt. And so the first thing that I ask people to do is stop, look, listen, pick your head up and look around people, talk about leaders having vision, you know, forward vision leaders also need to have peripheral vision, and dealt, stop, look and listen and see this situation around them and particularly the people around them. Gene Hammett: I want to dive into the book here because a lot of this stuff is just I think excellent and I want to give you a chance to share some of the things you’ve really organized this cause. I know I wrote a book last year and I really love the process of writing the book. Not that it’s easy, but it allowed me to really organize my thoughts into a much more sequential way. What did you realize about yourself when you were writing this book? Carly Fiorina: First, I agree with you. This is my third book actually, and I like the process of writing books a lot. I think the process for me of writing this book was slightly different because I was trying very hard to distill everything that I’ve learned about collaborating effectively with others. Every single I’ve learned about problem-solving, everything I’ve learned about leadership into a book that is simple to understand, accessible to anyone, whether they’re in a business, whether they have an MBA, they could be a nonprofit leader. And so I that it’s actually harder to make something simple than it is to keep it complex. Carly Fiorina: Well, that’s okay, but who was it who said, you know, if you give me enough time, I can do it in two pages. But otherwise, it takes 20 pages. Something to that effect. I mean, it’s just easier to be complicated. Gene Hammett: And the quote is very much similar to that. It’s basically, I would have written you a short letter so I didn’t have time. Carly Fiorina: Yes, it’s Mark Twain. Gene Hammett: I’m glad you brought, you jogged my memory there because writing something very succinct and simple and powerful is hard. Gene Hammett: When you went through this book, there’s one element in here that I want to pull out. Again, you know, leaders really learned to recognize their own power, but they’re also able to multiply that power for others. So how do we recognize our own power? Carly Fiorina: Well, I do think part of that is to recognize the things that are holding you back. So the fear, a lot of times people will say to me, well, I’m not afraid of anything. And I’ll say, yes, you are. You’re afraid maybe of making a mistake. You’re afraid of looking foolish. You’re afraid of being criticized. Fear of being criticized is huge these days because it’s so easy to criticize others on social media, on whatever. So I think part of learning to recognize our own power is to face what we’re afraid of because until we face what we’re afraid of, we can’t really tap into all of our gifts, but recognizing our own power is only half the process. The other half of the process is to recognize other power because the only way you can multiply your power is to tap into the potential and the gifts and the power of others and collaborate with them. That’s how you accomplish more because doing something by yourself is never as worthwhile is doing something with a lot of others. Gene Hammett: I love this. I mean I was excited about having this interview and I’m smiling over your ear to ear because it really is, I think we think a lot alike in this. You’ve been through some tough times and in your personal life, overcoming breast cancer, overcoming, losing your daughter, and I am curious about what’s the toughest decision you had to make as a female leader of a huge company like Hewlett Packard? Carly Fiorina: Well, in some ways the toughest decision I ever made was that one to drop out of law school. I know that sounds so funny, but the reason that was a very hard decision all those many years ago is that I had to disappoint my parents profoundly and I had never that before. The hardest decision I had to make as a CEO was honestly when the board, and I got it, people assume it was the merger, the decision to acquire compact, but it wasn’t. It was actually the decision not to vote as a board member, as the chairman of the board, when I was engaged in a very important dispute with a couple of board members who were leaking confidential information out of the boardroom, and I made a decision that if I voted, the board would never come face to face with what they needed to deal with. It wasn’t a board that I had brought together. Carly Fiorina: It was a board that had brought me into the company six years previously and so I made a decision that the board was going to have to work this through. That was a very tough decision because the consequence of that decision was that I left the company and yet I thought it was not in the company’s interest to tie everyone up into a dispute that would last for months and months. I thought the board needed to come to a decision, come to it quickly and move on, but that was a tough one because it had a lot of consequences for me personally. Gene Hammett: Well I’m, I could imagine that being difficult and I’ve never had to make anything close to that level of decision, so I am glad you shared that with us. You know, we haven’t talked much about this at all, but you had a run for the presidency. I’m sure that that taught you a lot. You pulled out after the first primary, is that right? Carly Fiorina: Yes, I drew after the New Hampshire primary cause it was pretty clear. I didn’t have a pass at that. Gene Hammett: What is it that you learned through that process that you could share with us today? Carly Fiorina: The first thing I learned is something that George Washington told us in 1789 George Washington and his farewell address, the nation said the trouble with political parties as they will come to care only about winning. And that’s what I learned the process, which is dictated by the political parties. The political parties don’t have a lot of interest in primaries. They want to win. And I learned a lot about that. And I would say honestly, I think the political process doesn’t serve citizens well. That’s a long conversation, which we don’t have time for it today, but I would just say I talked to citizens all across this nation and I say pay attention to the power of political parties combined with the power of the media to dictate the conversation to us and to really constrain the number of options that we have for civil discourse in this country. Carly Fiorina: Well, I think everyone is agrees. This is not a time when we’re solving problems. By the way, we’re not solving any problems. Carly Fiorina: You’re a nice to say. Thank you. Gene Hammett: Well, I’ve enjoyed having you on the show to talk about your book, find your way. It really has an excellent book. Some of the things that we shared today or just a tease to what you could get from reading the book. If our audience wanted to stay in touch with you or check this out, where would you send them to? Carly Fiorina: Please come to CarlyFiorina.com you can contact me. You can preorder the book. You can see all the many things that we’re doing. Carly fiorina.com will take you right there and thank you so much for having me, Gene. This has been a great conversation. I really enjoyed it. Gene Hammett: You’re welcome. Thanks for being here. Gene Hammett: Well, what a great interview. Loved to be able to share this with you today. This is something I really love to talk about, which is the difference between managers and leaders and managers are not a bad thing, but we need additional leaders inside of our companies that are growing beyond the boundaries that we’ve set before them. If you want your company to continue to evolve, you want to make sure that you have leadership and that you are cultivating that so that they are growing inside your company. As always, if you have any questions about your company and your growth, make sure you reach out to [email protected] and as always, lead with courage. I’ll see you next time. And lastly, please leave a rating and review for the Leaders in the Trenches on iTunes (or Stitcher) – it will help us in many ways, but it also inspires us to keep doing what we are doing here. Thank you in advance! 405 | Learn to Increase Performace Lessons from Athletes with Alan Stein Jr.
386 | Are You Getting Ready for 2019? 364 | Customer First or Employee First? Which is best for you? 334 | Do you have self-care built into your schedule? 322 | How do you improve your culture? 310 | Hypergrowth Tips - Do You Have True Employee Employee Engagement?